Grand Marnier tastes like fake cheap candy compared to this stuff. Cheers! -The zest of 6 organic Valencia oranges - no pith! -750 ml Armagnac de Montal VS brandy or best you can find. 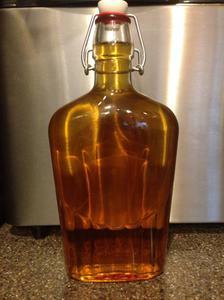 -Use a spare 1 liter liquor bottle to put everything in. Save the brandy bottle to filter back into. 2. In batches, combine sugar and zest with mortar and pestle. Pound until paste-like. 3. Mix in Armagnac and allow to macerate 4-6 months. 4. Filter through a coffee filter. It will take a while to filter! Shake in a shaker and pour into a salt rimmed glass.